383 pages | 40 B/W Illus. Over the past 20 years, the emergence of clone theory, hyperequational theory, commutator theory and tame congruence theory has led to a growth of universal algebra both in richness and in applications, especially in computer science. Yet most of the classic books on the subject are long out of print and, to date, no other book has integrated these theories with the long-established work that supports them. Universal Algebra and Applications in Theoretical Computer Science introduces the basic concepts of universal algebra and surveys some of the newer developments in the field. The first half of the book provides a solid grounding in the core material. A leisurely pace, careful exposition, numerous examples, and exercises combine to form an introduction to the subject ideal for beginning graduate students or researchers from other areas. 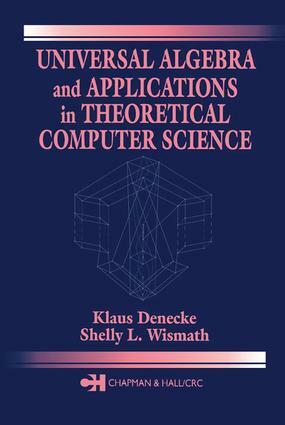 The second half of the book focuses on applications in theoretical computer science and advanced topics, including Mal'cev conditions, tame congruence theory, clones, and commutators. The impact of the advances in universal algebra on computer science is just beginning to be realized, and the field will undoubtedly continue to grow and mature. Universal Algebra and Applications in Theoretical Computer Science forms an outstanding text and offers a unique opportunity to build the foundation needed for further developments in its theory and in its computer science applications.